If you have a wild and crazy family vacation planned, or you’re closing up shop to travel the world, why not chronicle your story and learn some valuable skills along the way? Learning WordPress has been the key to a self-sustaining online career for many people. Here are some of our top picks for you to create a blog that tells your story while you travel and rest, or to create a travel booking or tour business! I put the Adventure travel blogging theme by Organic Themes at the top of this list because it is built to share the journey. As you chit each destination, Adventure becomes a dynamic, living chronicle of your escapades around the globe. You can display your latest posts in a beautiful featured slider at the top of the home page. And the about widget let’s people discover your mission straight off. With many cool features, such as the Google maps widget for displaying your location, this theme is ready to go. Just start snapping photos and honing your travel writing. Competitive Advantage: Ready-built for travel blogging with a beautiful and effective design. 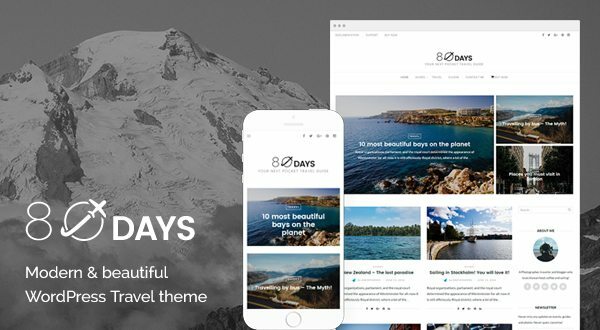 80 Days, a premium travel blog theme by gretathemes boasts offers attractive layouts and typography for travel writing and photography. This theme has a magazine-like grid layout with a cool sticky post header option. It’s fairly lightweight: easy to configure but compatible with all browsers and screen sizes. Choose this theme for a clean modern look and feel for your blog. Competitive Advantage: Quick set up and elegant layout options. 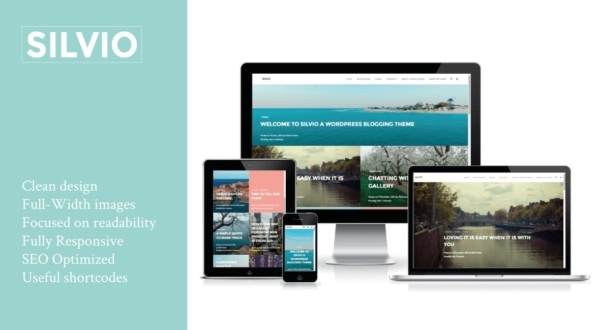 SiloCreativo offers something a little different with the Silvio travel blog theme for WordPress sites. The layout is an eye-catching, full-width grid, coupled with amazing text overlays and category tags that make this site pop. If you’re looking for something that strips your blog down to the photos and the articles, no fluff, this is what you want. Try the demo and see how cool it looks for yourself. 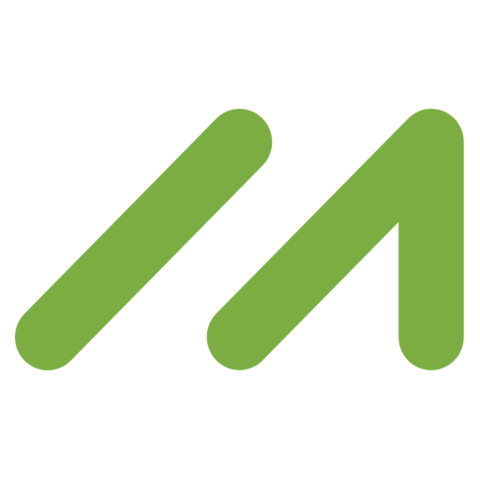 Competitive Advantage: Attractive, unique full-width blog feed. Are you so good at traveling that you feel the need to show others how it’s done? For a price? The Yatra travel/tour booking WordPress theme by Layero Themes is perfect for building your travel business. Sell tour and travel packages right from your website. This theme includes a booking page so you can manage this very complex process without writing a line of code. This is your fast track to a very professional travel booking site or blog. Competitive Advantage: Designed to make booking trips easy. The Explorer blogging WordPress theme from Anariel Design offers a simple blogging experience. Share your experiences with the culinary conventions you discover on your travels, or detail the historical spots you’ve visited. This is a great platform to build a niche travel blog and monetize your website. With WooCommerce integration, you can offer up merchandise and sell products through your blog. This is a great option for a travel gear review site as well. Competitive Advantage: Great blog design and WooCommerce integration. 7Theme has created something for those who want to create a travel destination with the Marea hotel & travel WordPress theme. Display beautiful photos of your hotel or resort along with a list of your amenities and customer testimonials with the demo import. Allow customers to contact you for booking straight from your website. Feature activities and events with the blog to keep your customers engaged and make sure they have the best experience. Competitive Advantage: Perfect set up for a hotel or resort, out of the box. The ZenBlog WordPress blog theme designed by GBThemes offers a rich, flexible content experience valuable to all types of bloggers, including travelers and explorers. Choose your style and make unlimited color customizations to get the feel of your blog right. If you blog about a particular culture you love, or many cultures, this theme is a great option because it is so customizable and easy to use. Competitive Advantage: Endless customization built on top of a lightweight blogging platform. If your wanderings are centered on capturing the essence of places, people, things, or the natural beauty, try the Ina photo blogging WordPress theme, brought to you by MatchThemes. choose from a number of grid layouts to express your travels through your lens. This is an easy starter because you can import the demo you like most and start filling it in with your catalog of shots. Your homepage will be a story told through your photos. Competitive Advantage: Optimal design and customization for photo-driven content. ThemeRex’s Mariana lifestyle and travel blogging WordPress theme is great for those solopreneurs who want to earn a living while traveling, and writing about, the world. This is a truly beautiful theme, and includes diverse styles to create a unique blog for your stories. The MailChimp integration will help you build and maintain a following of subscribers who look to your lifestyle and travel advice. Competitive Advantage: Beautiful, easy to use theme with tools for finding a loyal audience. I want to end this list with something exceptionally versatile. The Core multipurpose WordPress theme from ThemeFuse is known for its amazing demos. You get over 20 website concepts in one, plus you can build your own idea with the Advanced Visual Builder included with the theme. One-click import the travel blog demo, and add any of the almost endless features included with the core, such as google maps integration, to make your blog the best it can be. Competitive Advantage: Amazing one-click travel blog demo and high value plugins and features included in the theme. Any of these themes will get you started with travel blogging or booking. And, honestly, this is probably the most exciting way to learn a new skill. If you need help choosing a theme for your idea or you need help with something simple, give us a call at 855-464-5345. Mojo Marketplace always with the best templates! I personally wish I would’ve thought or ever entertained the idea of travel blogging. Back in the late 1990’s and early 2000’s, I didn’t even know you could own your own domain name and knew nothing about web hosting nor blogging. Yet alone, travel blogging and earning a living from it. Today I strive to create meaningful content discussing an array of trending topics, even mildly discussing traveling to certain places. If I would’ve known earlier in life that people are becoming travel blogging and internet marketing millionaires quietly, I would’ve put more effort and time into this and would’ve been way further in my side hustle freelance career today than I’m currently in. I agree that it would’ve been cool to get into it back in the day, as it was emerging. However, now is really one of the best times to start. WordPress blogging tools are better than ever, and most of the stuff you would have trouble figuring out back in the early 2000’s are free plugins now. At least from a technical standpoint, getting into it is super easy. Thanks for your comment!